The new generation Land Rover Discovery might be capable of tackling the toughest off-road terrain in the world but for most owners it’s appeal lies in its driveability on Tarmac and it’s spacious luxurious interior. Driving through mud or over boulders in their pride and joy is the last thing most buyers would contemplate. And when you get behind the wheel of this upper class seven-seater it’s not hard to understand why. The Discovery has come a long way since the first model was introduced back in 1989 when it was more functionality than luxury that was the order of the day. The new HSE model, however, boasts everything from premium quality leather heated seating all round to electronic air suspension and panoramic glass roof. Even the third row of seats, which fold completely into the floor to give more luggage space, can now be raised back into the upright position electrically by the touch of a button. And when it comes to opening the powered tailgate when your arms are full of parcels you simply move your foot under the luggage compartment and hey presto it opens automatically. With the third row seats folded the Discovery boasts 1,137 litres of luggage space, rising to a cavernous 2,406 litres – the capacity of a medium sized van – with rows two and three lowered. The sheer size of the Discovery means passengers are spoiled when it comes to space on board, with second row travellers getting limousine-like legroom as well as generous shoulder and headroom. The high stance can make it a bit awkward for some people to get in and out – although you can lower the suspension to help them – but the height of the vehicle is one of the big plus points for a lot of drivers because of the good all-round vision. And despite being higher – not to mention longer and wider – than most vehicles the Disco corners impressively, with barely any roll at all. Pot holes and badly repaired British roads are soaked up with barely a blink of concern and if you happen to hit heavy snow on your way home you can simply use the Discovery’s Terrain Response system to ensure you arrive unfazed. The 2.0-litre, four-cylinder Ingenium engine makes light work of pulling this giant Tonka toy-like vehicle, taking it from standstill to 60 miles per hour in just eight seonds. A superbly smooth eight-speed automatic gearbox ensures you can power along while still keeping the revs low to save fuel. If you do want to press on quickly there’s a Sport setting on the gearshift as well as paddles behind the steering wheel for manual gear changes. And while it’s obviously not designed as a performance vehicle it’s no slouch when you put your right down hard whatever speed you are doing. 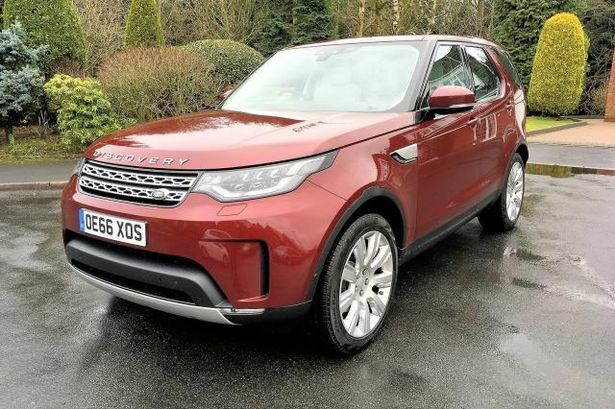 This fifth generation Discovery is well equipped to ensure you have no problems with parking thanks to sensors front and rear and a superbly clear colour reversing camera. And if you still have any concerns you can order one with Park Assist (£935) and let the vehicle do the job itself. Mechanical: 240bhp, 1,999cc, 4cyl diesel engine driving all wheels via eight speed automatic gearbox.